Amazon is looking to take up all your spare time. If you’re an Amazon Prime member, you’ve had streaming movies and television shows for awhile, with the recent addition of streaming audio files from Amazon’s library. Now they’re looking to turn their record-breaking Kindle device into a portable library in the truest sense of the word. 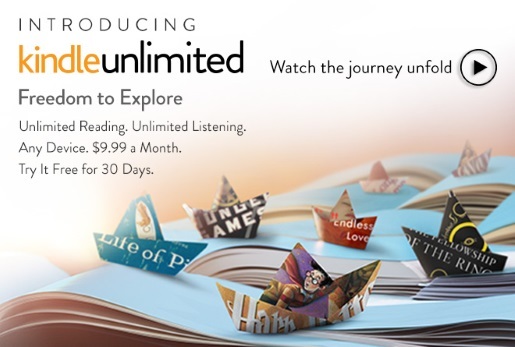 Amazon has announced Kindle Unlimited, an unlimited reading and audiobook library for $9.99 a month. “With Kindle Unlimited, you won’t have to think twice before you try a new author or genre — you can just start reading and listening,” said senior vice president Russ Grandinetti of Amazon’s Kindle division. Kindle Unlimited will not be a part of Amazon Prime, though Amazon Prime will still hopefully come with one free book rental a month (I’m a few months behind on finishing my most recent borrowed book). Amazon’s Kindle Unlimited is taking aim at services like Oyster and Scrib’d, both of which also do unlimited free e-books for a low monthly rate; neither of them has the power of Amazon’s built-in sales base, a fleet of drones, and the awesome power of the Kindle Fire connection making browsing and selection almost seamless, though.